Chelsea all but emulated the fashion in which they conquered last season's Champions League with a dramatic goal from a right-sided corner kick in the final moments of the match - this time in the 92nd minute, through Branislav Ivanovic. Jorge Jesus chose to leave the excellent Lima out of the starting line-up (replaced with Rodrigo), while his counterpart Rafa Benítez, without Eden Hazard, was forced to shuffle Ramires to the right flank and deliver midfield patrolling duties to club legend Frank Lampard. Otherwise, the starting elevens were pretty much as expected. Benfica looked like a transformed team from the one that were beaten by FC Porto last Saturday at Estádio do Dragão. Instead of playing the rare expectant brand of football they put on display in Porto, they reverted to their preferred style and it showed - both in a good and a bad way. Indeed, the Eagles immediately started pressing the minute the referee blew the whistle for the first time. Chelsea, in turn, seemed oddly overwhelmed and vulnerable down the middle, supposedly one of the areas of the pitch where they tend do excel. Faced with Benfica's high-tempo game and quick accelerations, the Londoners tried to slow the game down, even though Benfica were hardly willing to allow them to do it. In the opening stages of the match, Benfica effectively created several excellent chances largely thanks to Nemanja Matic and Enzo Pérez's superb work, only to be let down by their team-mates finishing. but their influence waned as the match wore on. 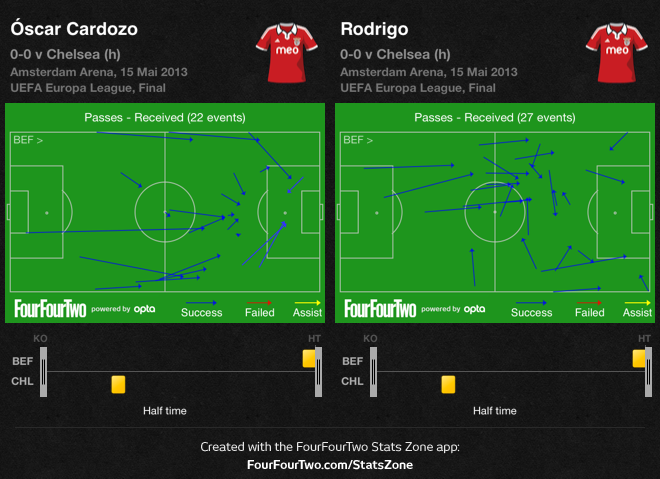 Still, the role that both Rodrigo and Óscar Cardozo played cannot be overstated. The young Brazilian forward tended to drop deeper and link up play, vacating the space for Gaitán to exploit and allowing Cardozo to act as a wall against which their midfielders could bounce their passes and thus meet Chelsea defence facing towards goal. Rodrigo dropped off to his left, often switching positions with Gaitán. One of the key issues during the first half was the distance David Luiz and Frank Lampard maintained between themselves, often allowing Benfica to bisect Chelsea's midfield and pose numerous threats to their defence. Rodrigo would attract David Luiz's attention, a move that was not duly compensated by Lampard - ergo a space that Benfica swiftly pounced on. During the first half, Benfica often pushed forward through the centre. The second half would not bring such good rewards, though. Benfica dominated the initial proceedings, with Chelsea struggling to get the ball forward for most of the first period. However, Benítez's men had a clear blueprint laid out for them by their coach, with Benfica's left side the favourite area for Chelsea's attacks. Not only was Ramires, the Blues' main threat in their counter-attacking approach, playing on the right, but Fernando Torres was also instructed to drift to that wing as well. After the initial 20 minutes, Chelsea started looking more in control, even though there was hardly the impression they were unbeatable through sheer defensive organisation. With Benfica keeping the English from playing out from the back, Chelsea were still finding it quite hard to get past Benfica's back line, even though they always looked dangerous as soon as the ball entered the area behind Matic and Pérez. 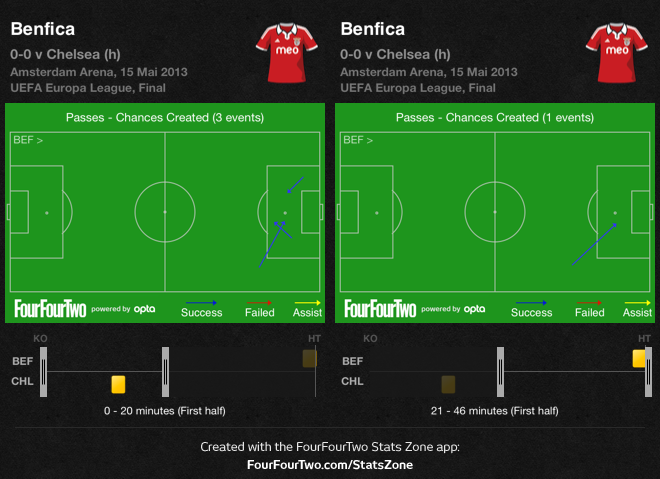 Benfica looked more incisive for the opening 20 minutes. The first half came to an end with the distinct impression that Benfica had been unfortunate not to have scored, something for which they can only blame themselves, after getting into such promising positions. By half-time, despite having attempted more shots, Benfica had hit none on target. The Portuguese vice-champions started the second half much in the same way they had opened the match - aggressive, direct and with a clear sense of purpose. However, after the first 5 minutes, where they again created some good-looking chances, Chelsea became more positive with their game, often bringing Óscar and Juan Mata into play (albeit still in counter-attacking mode). 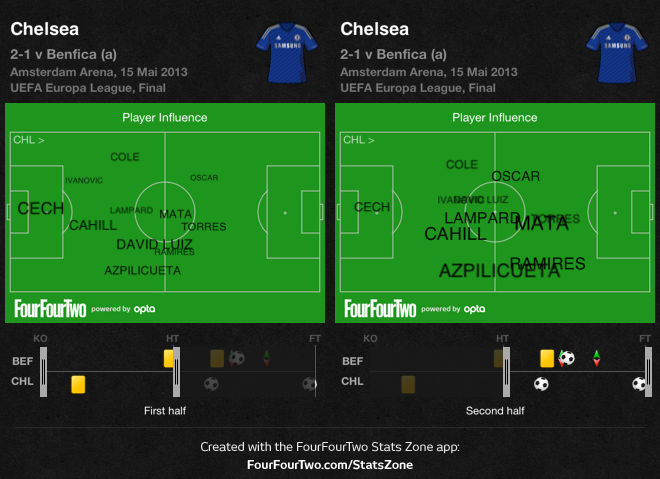 Chelsea were less expectant throughout the second half, as the player influence chalkboard clearly shows. 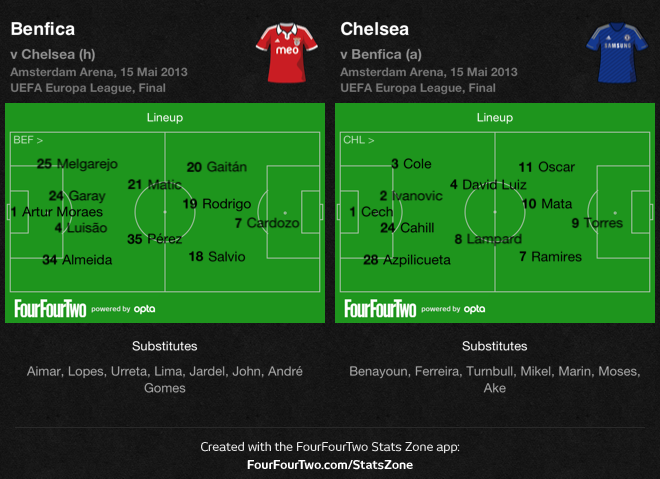 Also, notice the difference in space between David Luiz and Lampard in both halves. Benfica were managing to work the high defensive line well, but Chelsea's close off-side calls should have provided some warning to their opponents. Instead, the Blues were allowed to score their goal with barely a touch of the ball between Petr Cech and Torres, right down the middle - the area in which Benfica most often look vulnerable. Torres' work must be praised, but the way the goal happened (poor defensive transition on Benfica's part through the centre) can hardly be news for anyone to follows up the team up close. Even Cardozo was able to level the score though Azpilicueta's unnecessary handball from the penalty spot, by then Benfica were looking less able to stamp their authority on the match (you may want to check Matic and Enzo Pérez's chalkboards a bit farther up once more). The first-half intricate passing in the attacking third gave way to a more sterile approach in the second period. Moments before Benfica's goal, Jorge Jesus had replaced Rodrigo - not as lively throughout the second half - with Lima and Ola John for Melgarejo, forcing Gaitán to play at left-back. 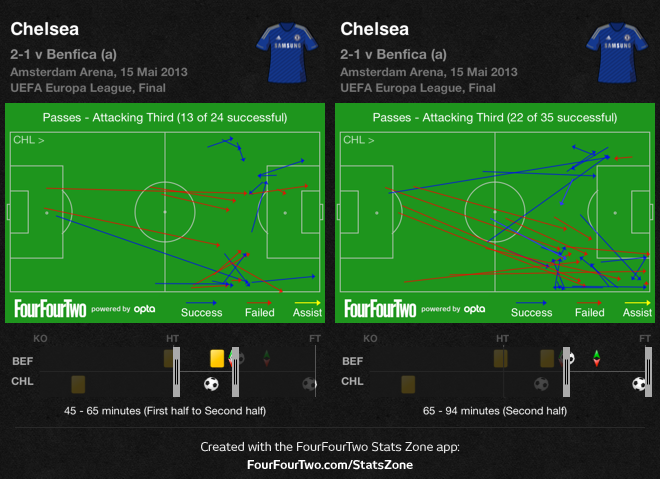 Chelsea immediately took their attacking down the right up a notch. 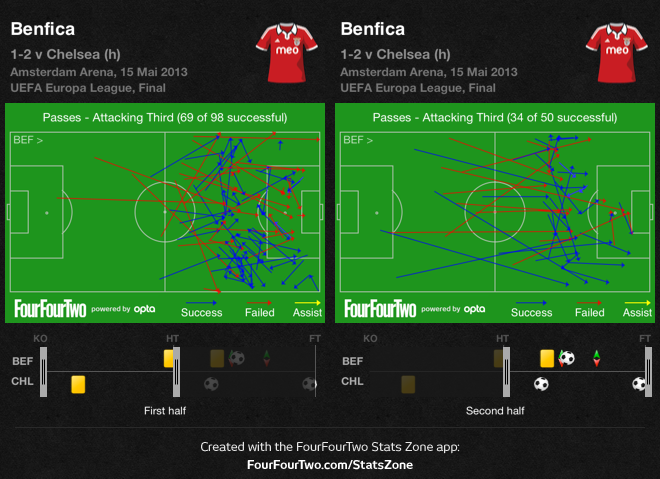 Chelsea smelled blood down Benfica's left side with Gaitán at left-back. Even though the Argentinean worked his boots off, his flank was still Chelsea's favourite target (particularly for Ramires) and it was fitting that the winning goal came from a corner precisely down that side, after another one of Ramires' many sprints. Even though Benfica players, coaches and fans alike will most likely feel gutted over the next couple of days, there is good reason for the club to look ahead with hope. The Eagles looked much more dangerous by remaining true to their style and the fans can hardly complain about the lack of an attacking bite this time around. Chelsea's maturity and experience at this stage proved all too important, but Portuguese fans must take solace in the fact that their sides do not feel as far removed from English teams as they once did. As for Chelsea, they will probably part ways with a coach that provided them with some stability, a presence in next season's Champions League and yet another European trophy. Not bad for a stop-gap solution.